The Transmission Line range of portable earthing is suitable for temporary earthing of conductors within the range 132kV, 275kV and 400kV. 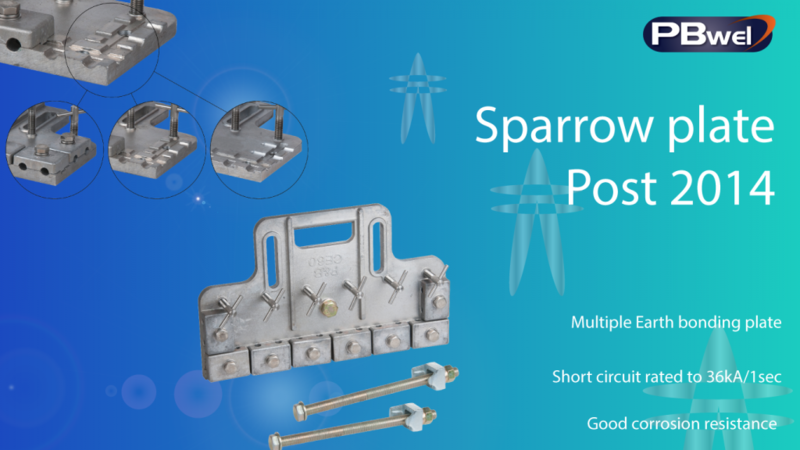 The new CE60 ‘2014 pattern’ Sparrow Plate is a multiple earth tower bonding plate. The registered design is for the control of induced currents and provides a common point of connection for earths, which will permit the safe and effective control of induced currents and short circuits. Manufactured from aluminium alloy, it can accommodate multiple earths. They are also provided with connections for interconnecting leads fitted with PB120F ferrule type terminations. Six thumb screws fitted with (replaceable) hardened tips effectively bond to the tower structure. Also available is the CE84 Transmission line DrESS tee connector employing cable clamps for use with bonds having PB120F ferrule terminations. Additionally, a new ‘back to back’ CE60 Sparrow Plate fitting kit has been developed and tested. In addition, we have a service available for the refurbishment and modification of existing CE60 Sparrow Plates to the ‘2014 pattern’. The short circuit rating for the CE60 Sparrow Plates is 31.5kA/1s and the continuous current rating is 900A. The short circuit rating of the CE84 is 36kA/1s and its continuous current rating is 600A.